After the fire at Mission and 22nd streets last February was doused, Sofia Keck’s Guatemalan hot dog joint Los Shucos next door was also snuffed out. This weekend, a little more than a year after the fire, Los Shucos will reopen for business on February 13. Water from firefighting efforts left everything in Keck’s kitchen so damaged the business could not continue to operate out of the small space next door to 3224 22nd Street. Shucos had been in business for about a year. The store had to shut down, but business survived by focusing on catering seven days a week, a practice Keck says will continue as the hot dog shop reopens. “I am nervous, a little bit, but you know, such is life,” Keck says. She’s also expanding the menu. The most prominent new feature will be “El de la Mission,” a hot dog with grilled onions and peppers. Why is it the one for the Mission? 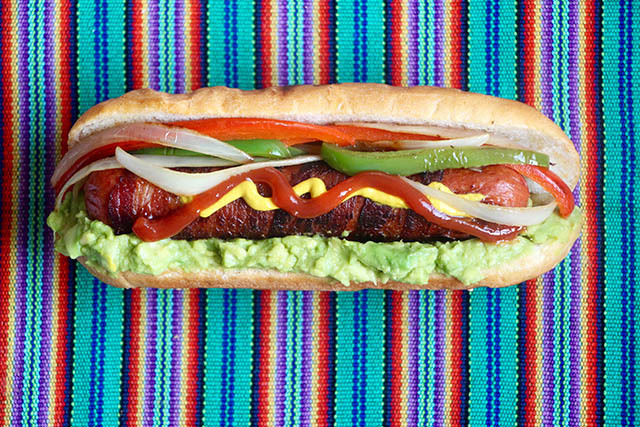 A dollar from each hot dog sale will go to a Mission nonprofit that has yet to be selected. Other additions include chicken franks and “mixtas,” essentially a cross between a hot dog and a taco. The store’s new hours are tailored to fit around a growing catering business. Los Shucos will only be open to the general public Thursday through Sunday, with Monday through Wednesday reserved for catering and private events at the store. That will be a bit of a shift from the Los Shucos’ previously boisterous late-night hours. The shop used to close at 2:30 a.m. – theoretically. Now the store will close at 10 on Thursdays and Sundays, and at 12:30 a.m. on Fridays and Saturdays. Still, Keck has some hiring to do to get to adequate staffing for the new business hours. She estimates she’ll add two more part time workers to her business. No telling, though, whether they’ll be Guatemalan – currently, her entire staff hails from Keck’s home country, which Keck says she didn’t plan. One thing’s for sure, slinging shucos is a lot of work. But the small business owner is excited to get back into it.